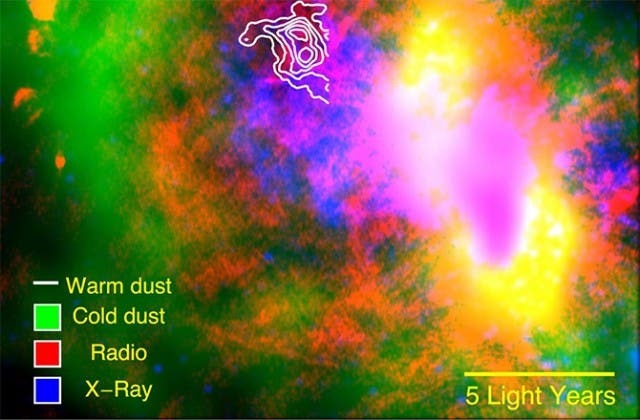 "Dust itself is very important because it's the stuff that forms stars and planets, like the sun and Earth, respectively, so to know where it comes from is an important question," said Ryan Lau, Cornell postdoctoral associate for astronomy. 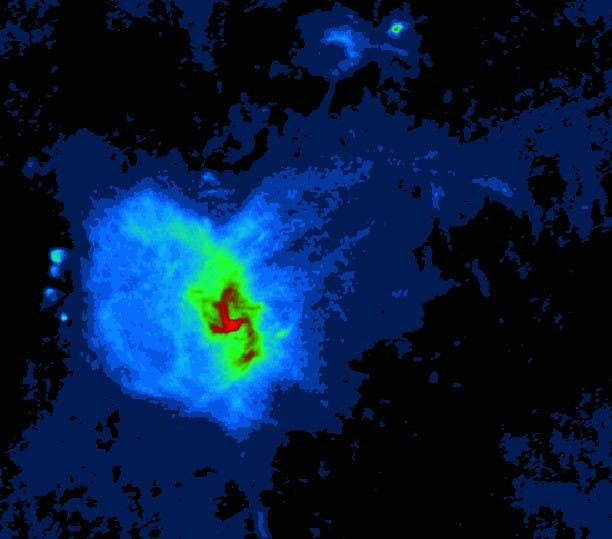 "Our work strongly reinforces the theory that supernovae are producing the dust seen in galaxies of the early universe," he said. Sifting through the center of the Milky Way galaxy, astronomers have made the first direct observations – using an infrared telescope aboard a modified Boeing 747 – of cosmic building-block dust resulting from an ancient supernova. Lead author Lau explains that one of astronomy's big questions is why galaxies – forming as recently as 1 billion years after the Big Bang – contain so much dust. The leading theory is that supernovae – stars that explode at the end of their lives – contain large amounts of metal-enriched material that, in turn, harbors key ingredients of dust, like silicon, iron and carbon. The research is published March 19 in Science Express. The astronomers examined Sagittarius A East, a 10,000-year-old supernova remnant near the center of our galaxy. Lau said that when a supernova explodes, the materials in its center expand and form dust. This has been observed in several young supernova remnants – such as the famed SN1987A and Cassiopeia A. In the turbulent supernova environment, scientists expect the churning dust to be destroyed. "That is theoretically," Lau said. "There have been no direct observations of any dust surviving the environment of the supernova remnant … until now, and that's why our observations of an 'old' supernova are so important," he said. The astronomers captured the observations via FORCAST (the Faint Object Infrared Camera Telescope) aboard SOFIA (the Stratospheric Observatory for Infrared Astronomy), a modified Boeing 747 and a joint project of NASA, the German Aerospace Center and the Universities Space Research Association. It is the world's largest airborne astronomical observatory. Currently, no space-based telescope can observe at far-infrared wavelengths, and ground-based telescopes are unable to observe light at these wavelengths due to the Earth's atmosphere. Joining Lau on this research, "Old Supernova Dust Factory Revealed at the Galactic Center," are co-authors Terry Herter, Cornell professor of astronomy and principal scientific investigator on FORCAST; Mark Morris, University of California, Los Angeles; Zhiyuan Li, Nanjing University, China; and Joe Adams, NASA Ames Research Center. Milky Way Found to Be Much Larger Than Thought –Extending Width 50% to 150,000 Light Years! "Our Solar System's Milky-Way Orbit Through Dark Matter Impacts Life on Earth"